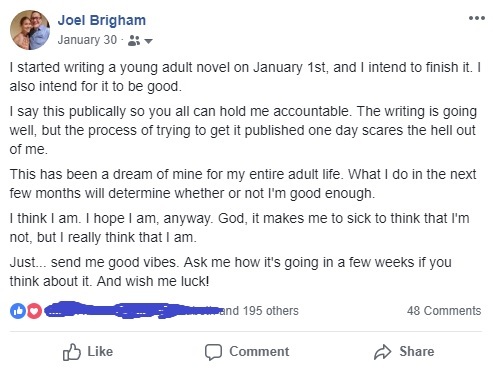 I didn’t post it for encouragement, and I wasn’t fishing for “likes.” Honestly, I already had all the motivation I needed to write the book all the way through. What I wanted was accountability, and hoo boy, have people been holding me accountable. 2. I can say, “It’s going really well, thank you,” and just leave it at that. Me, opening up my manuscript for another round of edits. More often than not, I go with the shorter answer because it’s the easiest way to protect myself from staring down any hope these beautiful, supportive people may show in their faces. I’m afraid they might not just be feigning optimism in my ability to write a publishable young adult novel, but that they may actually believe in my ability to write a publishable young adult novel. If that’s true, then I’m second-guessing my decision to hold myself accountable. The good news is the book’s done. I wrote the whole damn thing in two months and have spent the corresponding six months editing it with only enough time in between drafts to let it rest and marinate for some perspective on my revisions. In June, I went to a writers’ conference in Chicago and was given the opportunity to pitch my book to an agent. At that point, I wasn’t done editing but had enough finished to put together an agent query letter. I wanted to get some feedback from an industry professional so I could mull over my shortcomings in that area while finishing the book itself. It was the first time I had ever shared the idea with someone who wasn’t my friend or relative, and I was genuinely surprised when she asked to read the full manuscript of the book. All I wanted was some notes to consider, but I what I ended up with sorta skipped a few steps in my expectations for the process. Being asked for the full manuscript is an exciting thing, so I spent a few weeks submitting it to one more big edit. Then I sent it off. 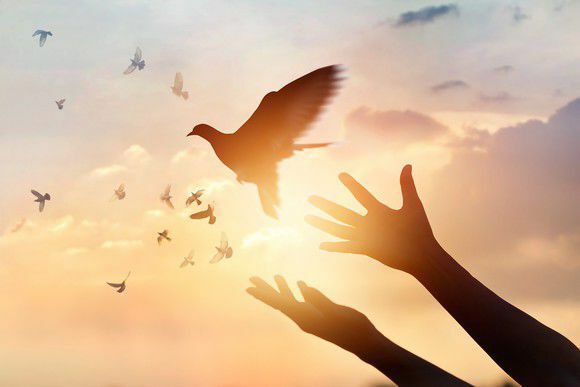 The agent was unbelievably kind in her rejection, and despite knowing the book wasn’t a good fit for her personally, she read the whole thing and provided me with the sort of usable feedback I had been craving. A handful of beta readers also finished the book in June and July and actually said a lot of the same things as the agent, so I spent all summer re-writing and editing (including deleting an entire character, which felt like murder). I did it all in hopes of drastically improving the book. I succeeded in at least that much, so this week, I submitted the manuscript to Pitch Wars, a program that tries to place aspiring writers with mentors who either are professional editors or have been previously agented and published before. Well over 3,000 people applied to as many as four of the 100 or so mentors, so I’ve got about a one-in-120 shot at earning this opportunity. Based on the mentors’ wish lists, I don’t think I’ve written anything close to what any of these prospective mentors are hoping to read and ultimately partner up with, but one does not win what one does push into the pot. I applied to four mentors, and now I’ll wait for six weeks to receive an email requesting more materials. All of this is to say I have not submitted my manuscript to agents since my rejection from that first one. The book is as good as I can personally make it, so I’m hoping that if I am chosen to work with a mentor, they can help me improve upon some things so it’s more in line with the industry standards I know so little about. If I’m not chosen, I can always invest several hundred dollars into an editor, but it may be tough to earn a return on that investment, especially with no guarantee the editor will be a good fit. Look. My whole life I’ve been in a hurry, often at the expense of settling for “good enough” instead of “this is the absolute best I can do.” The lone exceptions to this have been my wife (who did not make courtship easy on me) and my book. I want to do this the right way, so while I’m writing and/or revising every day, I’m okay that the end of this process still resides in the distant future. 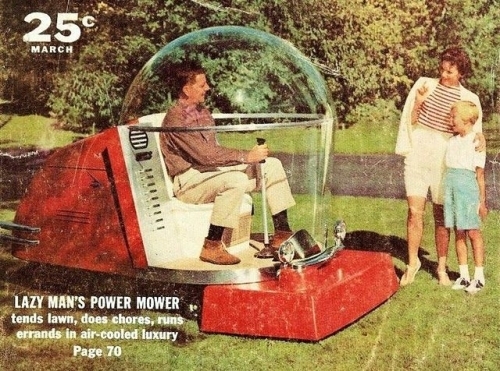 A future where a man can read my book while mowing the lawn! At some point, I’ll start the querying process in earnest. I’ve heard stories of people sending out 200 or more queries over the course of a year and getting denied by the intended agent every single time, often in the form of no response at all. I’ve also been reminded that the publishing industry is very subjective and that it only takes one agent to fall in love with a book and offer representation. I believe what I have written is good. It’s a real book, with stakes and character growth and tension and all those literary nuggets essential to good writing. There are parts in of my book that I believe are really, really good. A couple chapters are great. But is the full manuscript good enough to be the type of book that people will consider one of their favorites? That they talk about to other people, and purchase multiple copies because they keep loaning them out to friends who never return them? Is it the type of book they love so much that they have to buy it for their family members at Christmas and birthdays? Because that’s probably how good it needs to be for an agent to represent it and a publishing house to print it. My dad said, “It’s like trying to sell a song in Nashville,” and the more I learn about all of this, the more I think that’s really true. If you ask me how the book’s going, I’ll tell you, “It’s going really well, thank you.” And I’ll mean it. I just don’t know if it’s good enough for publication. I always did intend for this book to be good. I’m still aiming for great. And I’m sure you’ll hold me accountable to that.